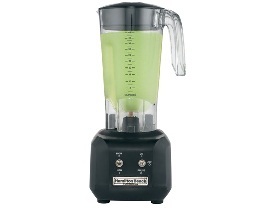 20 Second Daiquiri - When thirsty customers are waiting, you can blend 0.5 L drinks in 20 seconds flat. Two Speeds with Pulse Option - Offers versatility and precision blending for a wide variety of food and drink mixtures.- Breakresistant polycarbonate container with filler-cap and easy-to-read measurement marks makes filling and pouring easy. 1.25 L Stackable Container - Breakresistant polycarbonate container with easy-to-read measurement marks stacks up for storage.